No Halloween candy without a permit, sorry. 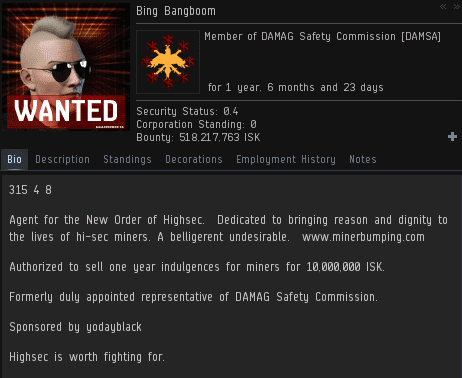 BBB, renowned for his 'Cry Havoc and Let Slip the Dogs of War' saga, is a true hero of Highsec. I am proud to have fought by his side upon the bleak icefields of Kamio. We followed our Supreme Protector into battle, slaying miners in droves. Alas, my glory days are behind me. But not so for stalwart Bing! does this blog just run on a loop???? because every time i bother to look in here it's exactly the same thing the only thing that changes is the names of the gankers and their victims ?? Since ancient times, literature has always had a few fundamental themes. The fight of good against evil, the laudation of certain moral standards, the adventures of great individuals in the face of adversity. You could say the same about literature in general - why does it run on a loop? What new is there between the works of Rowling, Shakespear and Homer? Nothing. And everything, at the same time. Some concepts never grow old, since they are the epitome of what humanity should aspire to be. thats the answer i expected something along the lines of the juvenile "i know i am but what are you" theme, well done. now thats a proper reply, kudos sir!! good literature has many twists turns and nuances of all kinds woven into it's pages,this storyline unfortunately does not, find miner to kill,kill miner, publish miner tears, that would constitute a loop i believe. Lots of tears about nothing. Even more win! That's a lot of text for a Retriever kill. Way to go. Do the code carebears ever leave highsec? Which part of "New Order of Highsec" is unclear to you? Or were you AFK at your reading classes too? Bonus point for using "quaint" in your convo; well done. Education takes many forms, I see.